Searching for life in the city without a high-rise address? Townhouse living is the perfect solution. With spacious 2 and 3-story townhomes inside and outside the Perimeter, we have just what you’re looking for. Express your personal style in these Rockhaven townhomes that inspire chic urban living. If a trendy, modern townhouse inside the Perimeter is what you’re seeking, look no further than Cosmopolitan. These 2-story townhomes reflect the style of their urban address nestled between Buckhead and Midtown. The open floor plans of the townhomes at Cosmopolitan provide the ideal space for entertaining friends after a night on the town. Boasting contemporary finishes from the lighting to chic built-ins, these urban townhomes are sure to make a statement. Parc at Chastain is located right outside of the Perimeter in Sandy Springs. With an easy commute into town, you’ll enjoy all the benefits of urban living without the big city address. These charming craftsman-style townhomes offer both luxury and comfort. Their 2-story floor plans feature 3 bedroom layouts with stylish finishes in every room. From the spacious first floor living area to the lavish master suite, you’ll never want to leave home. Plus, when you buy your new townhome in Parc at Chastain, you’ll receive a free pool membership at Chastain Park Athletic Club! Also located in Sandy Springs is Reserve at City Center. 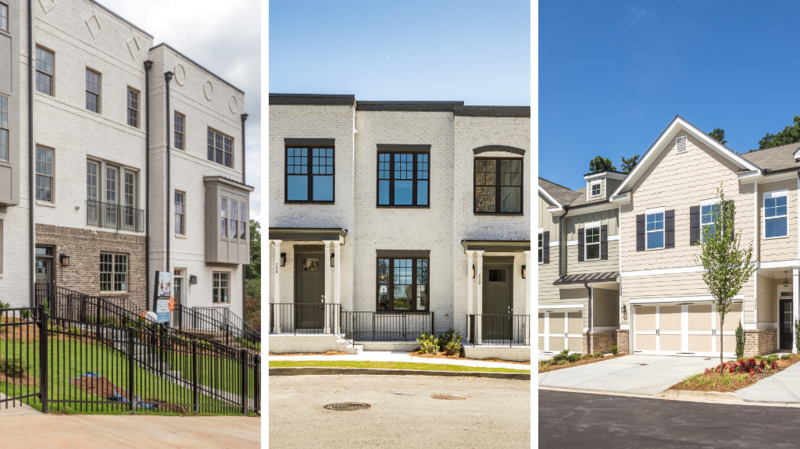 Not only does it provide walkability to more than 80 points of interest in Sandy Springs, but it also boasts 15 breathtaking townhomes. The appeal of these townhomes starts with their all-brick exterior but doesn’t stop there. Inside, you’ll find a variety of stylish modern finishes. From the subway tile in the kitchen to the marbled tile flooring in the master bath. Additionally, you’ll have your own private patio to enjoy dinner with your family or an outdoor barbecue with your friends. Ready to find your new home in one of these Rockhaven Homes communities? Contact us today by filling out our Cosmopolitan, Parc at Chastain, or Reserve at City Center contact forms. Our onsite sales associates are ready to help you start living in one of our new townhomes that inspire chic urban living. Additionally, make sure to follow us on Facebook. There you will find all the latest news on these communities, our upcoming events, and more!